I would like to invest in a single 100° EP to try it out. My scopes are a 8" SCT F10 and a ST80 F5. The main scope is the SCT and should have priority. So I was thinking that it would be nice to have some good magnification for the 100° EP. The range I am thinking about would be between 9-13mm. The reason I do not go below 9 is that I am rarely capable of getting a clear view of the stars with the BHZ on 8mm. Based on the reviews I checked the APM has a very good reputation but for some reason not that much marketing for it. The eye relief of 13mm scares me a little. I wear glasses but always put them off when I look into the EP. I fear that 9mm will give too much magnification and therefor not be usable that much. For the 10mm Omegon, the eye relief is way better (19.7), but the review are not as good as for the APM. The APM 13mm sounds pretty good, except for the 13mm eye relief. Edited by qaiden, 20 March 2019 - 01:20 PM. I once had a 13mm Ethos; best glass that I have ever had the privilege of looking through. Wish that I had never sold it...or my TV-60. The Omegon isn't truly a 100° eyepiece. I recommend the APM 13 among the ones you mention. 2) It is the most likely of your choices to yield a magnification that will always be "under the seeing", i.e. not blurred by poor seeing. Don't worry about the eye relief. It'll be fine for someone who doesn't wear glasses. And, you'll be back later to get the 20mm and 9mm. I kind of feel like eye placement issues can a function of excessive eye relief or large exit pupil. A shorter FL eyepiece should have a smaller, easier to hold exit pupil. But 24mm in a SCT wouldn’t exactly produce a large exit pupil. For a non-eyeglass wearer 13mm should be fine. Certainly some eyepieces are more prone to blackouts than others. I don’t tend to have problems with my ES 24 82 but that’s me. Not particularly sensitive to eye relief issues, I think the APM HDC 13 is a fine eyepiece that would serve you very well and likely become your favorite as Don says. As others have pointed out in the forums, even if you back off from the eyepiece a bit due to your glasses you will still likely effectively have a 90 or 95 degree AFOV eyepiece. And I'll add again - a very good one too. The OP says he removes his glasses to observe. That improves the odds of using the eyepiece easily. With an 8" SCT I would recommend the ES 14/100. Only one for glasses wearers is an ES92 12mm. 8 fewer degrees, costs more, but 19mm eye relief. I agree with Don, the AMP 13mm will be your most useful power. With your 8" SCT it will provide 156x and a .64 degree or 38.4' arc minute field. Globular clusters will really look nice at that power. Your ST 80mm with the 13mm will have a power of 30.7x and a wide 3.25 degree field!! At $249. its a great buy. The 9mm on your 8" SCT would be 225x with a .44 degree or 26.6' arc minute field. That may be too high a power for most objects, depending on your seeing conditions. Edited by Astro-Master, 20 March 2019 - 03:49 PM. If purchasing one or both, definitely the APM 100° HDC 13mm (1st purchase) and APM 100° HDC 9mm (2nd purchase). I owned the ES 9mm & 14mm 100° plus the TV 8mm, 10mm and 13mm Ethos and 9mm APM 9mm 100° HDC at the same time (13mm APM 100° wasn't available at that timeframe. I did head to head tests comparing all the eyepieces on a 13.1" f/4.5 Dob with a Fullum refigured Coulter thin mirror (Strehl > 0.995). Comparisons included without and with TV Paracorr -Sold off the ES versions and kept the TV Ethos and APM versions. In a more critical shootout, the APMs are about 95% the optical quality of the TV Ethos. My comparisons were a much shorter focal ratio scope. Since you will using them on a optically critical f/10 SCT system, the APM versions are a "no brainer" to purchase. FWIW, I rarely use my TV Ethos, the APMs are that good ! ".....I would like to invest in a single 100° EP to try it out....."
I thought the same and managed to pick up a used 13mm Ethos a few years back (not many 100 options back then). I've 4 of them now (21, 13, 8 and 6mm) and at one point had the 4.7 and 3.7 as well. It's not just the massive field of view - the other optical characteristics of 100 degree eyepieces are excellent as well. They soon become rather addictive - you have been warned !!! I agree that the APM/Lunt 100's are probably the most attractive of the non-Tele Vue 100 options currently out there. Well, I still use Ethos in focal lengths I have and the APM HDC in focal lengths I have but I use them w/o a single consideration of one having higher capability, just which is appropriate for the observation. I sold all the ES100's I had (20, 14, 9) long ago as they just didn't match up for me. Glad to hear! I just spent the better part of my tax refund and took the 100 degree plunge on the APM 9 and 13. I was perfectly content with my 82 degree ep's but bigger is better right? $250 is still a lot for an ep, at least for me, but it seems like a huge bargain when compared with the ES100's($399) and the ethos'(>$600). I figured I'd better get 'em while I can. Can't wait for some spring galaxy hunting with my 16" canon...and new eyepieces. I wish they had a 7mm, very useful higher power eyepiece in my dobs. Another vote for going with APM 13. 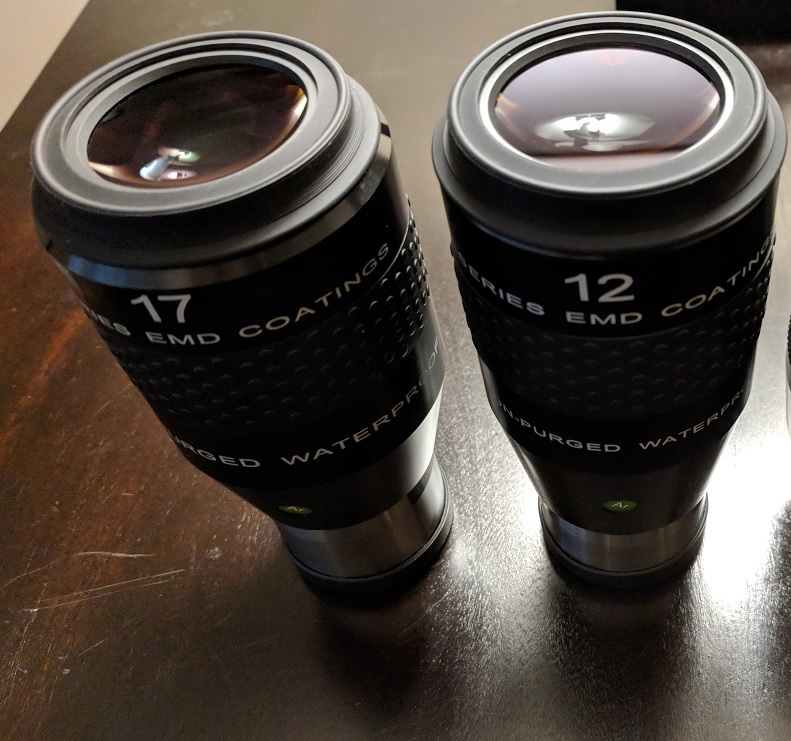 I have had a full set of Ethos, the ES 9, 14, 20, Nikon HWs in 12.5 and 17, and the Telescope Service version of the 9mm/100 (optically same as APM), and currently have the APM 20. Assuming similar performance to the 9 and 20, I'd take the APM over the ES for sure. Uh, oh, welcome to the world of 100 degree EPs. If you are anything like me, you will get hooked. I'd recommend the 13 APM first, and if you like that get the 9 APM/Lunt afterwards. You will use the 13mm a lot. I own the 9 APM. It is one of my favorite eyepieces. It is very comfortable, even though the eye relief might look intimidating. It is also sharp and contrasty. In my wife's opinion and my own opinion, it bested the 10mm Delos on Saturn, Jupiter, and several planetary nebula. Colors seemed more vibrant too. Just purchased the 13mm APM. Like I said, I do not wear my glasses when using the scope. The APM 13mm would be your best bet. The 9mm offerings would be a bit too dim for general purpose work in you F/10 SCT (.9mm exit pupil). The 13mm would more manageable at 1.3mm exit pupil. One of the most used eyepieces in my 8" F/10 SCT was a 12mm Nagler. A bit dim, but the magnification it provided was great on a lot of targets. I would say that a 13/100 eyepiece fits the bill more appropriately. Then again, 9mm in the ST80 would also be very good. Nikon HW 12.5mm 100 AFOV w/ EIC 10mm is a two for one (use as either 10mm or 12.5mm both 100 AFOV) 1.25" eyepiece that can be used on either scope. Can order on amazon.jp see other discussion topic. I have 10mm 100 AFOV Ethos which is also 1.25" that can be used on either scope. If you buy a 2" eyepiece you would require a 2" GSO diagonial to use on your ST80. APM and ES eyepieces are great value. I like the APM having a 2" barrel adapter. Second the ES92. ES beating TV, and themselves, at their own game. "...I would like to stay below 300 euros (Ethos (650e) and ES92 (450e) are just too expensive even so people are praising them lile gods..."
What do you suggest below 300 Euros ? Edited by John Huntley, 25 March 2019 - 03:05 PM.